Scenes of human sacrifice are often portrayed in Moche murals and on ceramics. Archaeological evidence for human sacrifice among the Moche includes men, women, and children who accompanied lords or dignitaries to the afterlife. 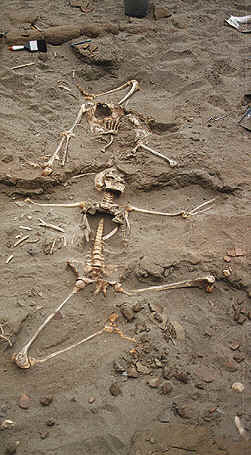 In 1995, Steve Bourget, a member of the Archaeological Project Huaca de la Luna, uncovered 42 skeletons of adolescent and young men who had been sacrificed in Plaza 3, located between Platforms I and II, where a small rock formation resembles Cerro Blanco looming behind. Is this a simplified version of the sacrifice on the mountain scene often shown in Moche narrative art? All the evidence seems to indicate that this is so. These mass sacrifice rituals did not occur regularly. The thick layers of sediment in which excavators found the bones of the sacrificed victims indicate that these rites took place during heavy rains brought on by an El Niño event. These rains caused extensive flooding, which destroyed irrigation canals and field systems and affected the economy and central power structure of Moche society. As we have pointed out, the multicolored murals in the interior patios and the images represented there probably portray the Decapitator, the Moche deity to whom victims were sacrificed in propitiatory rites to ensure the fertility of crops as well as the continuity of the structure of Moche society. We propose that these sacrifice rituals may have taken place at the Huaca de la Luna and especially in the patio whose friezes display the image of the Decapitator. In sum, the Huaca de la Luna served as the principal Moche temple where the rites and central ceremonies that guaranteed the renewal of Moche ideological power, on the one hand, and the renewal of power of the gods' alteregos who governed Moche society, on the other. In this same view, the preparatory ceremonies of funerary offerings and rites formed part of the temple's central activities. In addition, it was also the setting for propitiatory cults dedicated to agricultural fertility, as much as the coming of water in the rivers as the fertility of the agricultural fields. The lack of a scientific explanation for death formed the basis for the creation of a complex ideological system where life and death formed a basic unit. Yet it was death that spawned the principal ceremonies and rites in Moche times: the construction of temples, burials and sacrifices, etc. For the Moche, death had become a part of life and although they could not understand it, this was no obstacle to making it a part of their rituals. In this way, death and the dead led separate lives: they danced, feasted and reproduced themselves in the same way as their living counterparts. This is why the Moche believed that the dead should be offered all that was necessary for their voyage to the afterlife. They believed that the dead had to be respected and remembered, for their ancestors were the intermediaries that assured the continuity of the system as a whole. Hence, the dead were venerated and remembered in well established ceremonies that marked the Moche religious calendar.